Sometimes I see something so creative an unique that I want to organize a party just to be able to use it! 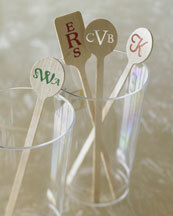 Aren't these monogrammed stirrers fantastic? 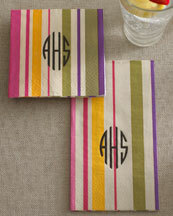 And guest towels with your monogram are so preppy and can be a constant in your guest bathroom. 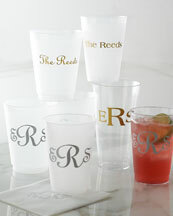 But my favorite has to be disposable party cups with a monogram or other personal touch. Of course, I'm old school and would get the monogram! Now, I just have to think of what to plan...in the meantime, I'll get the cups and guest towels for the next time! PS Many of you lovely ladies have requested the link where you can find these goodies. Here it is! And here's the best news of all! From now until October 29, take 20% off these items and get free shipping with the code TABLE. Happy Shopping!! I fell in love w/ the wooden stirrers when I saw them on another blog. I just need to have a party. And I want the link for the striped guess towels!!! I'll bug you about these! I love these wooden stirrers - where on earth did you find them? Can you please post a link to the monogrammed cups - I'm dying to get my hands on some! I bought those monogrammed cups for Lindsey's first birthday party 5 years ago!! Looove them!! The stirrers are too cute and I know the exact person who will be receiving them.